It was a cold, rainy and dreary day here yesterday. The kind of day that just begs for a bowl of hot soup and some homemade Skillet Cornbread. Apparently, my husband was thinking the same thing because that’s what he said he wanted for lunch. Since I had a bag of shredded cabbage sitting in the fridge that needed to be used, I decided to make some type of sausage lentil soup with it. If you aren’t familiar with sprouted lentils, you might be asking, why don’t you just use regular lentils? Here’s why I use them in my cooking. Sprouting them makes them easier to digest and the nutrients more readily available. You can sprout your own, or buy already sprouted and dried lentils like I do. The TruRoots brand can be found in natural food stores like Natural Grocers and the Kroger’s in our area also carry it. 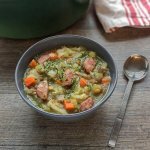 When I was looking online for some recipe inspiration, I came across a recipe of Robert Irvine’s on the Food Network for a Smoked Sausage and Cabbage Soup. One of the ingredients he used was whole-grain mustard. I thought that was an interesting sounding addition to soup. I had some stone ground mustard in the fridge, so I decided to give it a try. 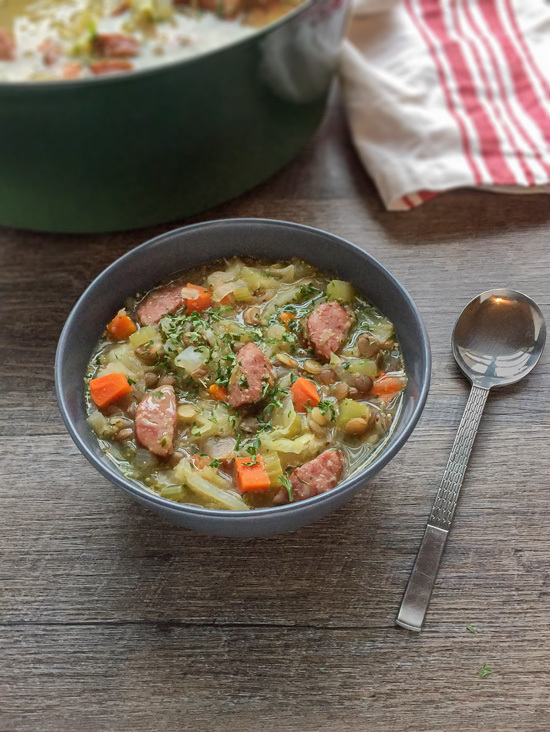 I’ll be honest, I wasn’t sure if I’d love this Smoked Sausage Cabbage and Sprouted Lentil Soup or not. The main seasonings I used were dried dill and stone ground mustard. Would it be tasty and flavorful? With my first bite, I was pleasantly surprised to find that not only was it good, but I actually loved it. I waited as my husband took his first bite, and I got the “Mmm, this is good!” that I was waiting for. We both were really looking forward to leftovers today. It would make a great meal anytime, but it’s definitely the perfect soup recipe for a cold Winter day! Heat the oil in a 4 or 5 qt. dutch oven or soup pot. Add the onions, celery and carrots to the pot, let cook, stirring occasionally until veggies begin to soften, about 5 minutes. Add the garlic and let cook for another minute. Add the cabbage to the pot, cover, let cook, stirring often, until softened, about 6 minutes. Add in the sausage, mustard and dried dill. Stir in the chicken stock and lentils, bring to a boil, reduce heat, and let simmer, partially covered, until vegetables and lentils are tender, about thirty minutes. Check seasonings and add salt and pepper to taste. Smoked Sausage can vary in saltiness, I prefer to wait until the end of the cook time to add salt.